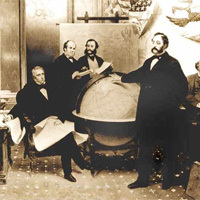 The purchase of Alaska in 1867 marked the end of Russian efforts to expand trade and settlements to the Pacific coast of North America, and became an important step in the United States rise as a great power in the Asia-Pacific region. Beginning in 1725, when Russian Czar Peter the Great dispatched Vitus Bering to explore the Alaskan coast, Russia had a keen interest in this region, which was rich in natural resources and lightly inhabited. As the United States expanded westward in the early 1800s, Americans soon found themselves in competition with Russian explorers and traders. St. Petersburg, however, lacked the financial resources to support major settlements or a military presence along the Pacific coast of North America and permanent Russian settlers in Alaska never numbered more than four hundred. Defeat in the Crimean War further reduced Russian interest in this region. For three decades after its purchase the United States paid little attention to Alaska, which was governed under military, naval, or Treasury rule or, at times, no visible rule at all. Seeking a way to impose U.S. mining laws, the United States constituted a civil government in 1884. Skeptics had dubbed the purchase of Alaska “Seward’s Folly,” but the former Secretary of State was vindicated when a major gold deposit was discovered in the Yukon in 1896, and Alaska became the gateway to the Klondike gold fields. The strategic importance of Alaska was finally recognized in World War II. Alaska became a state on January 3, 1959.